There is no question that global climate protection is one of the greatest challenges of the 21st century for us all – energy providers, scientists and consumers. Therefore even in these times of economic crisis, the interest of the people concerning global warming needs to be kept alive. Since 2009 the Technische Universität Berlin has organised a series of academic events called "Climate Lectures" regarding this topic. During these lectures renowned international scientists and politicians present topics in the areas of climate- and energy science, to a highly ranked public audience from politics, sciences, economics, and society. This lecture is targeted towards interested students, scientists, businessmen, and politicians. 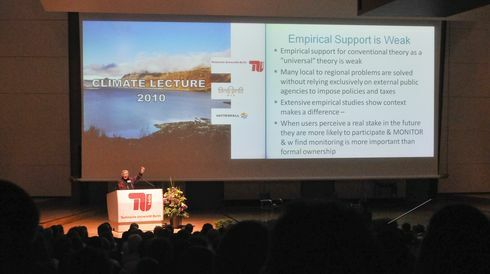 These lectures at the TU Berlin were joint events of the Potsdam Institute for Climate Impact Research (PIK) and the European energy provider Vattenfall until 2012. In 2016 the lecture is supported by the Stiftung Mercator. Ottmar Edenhofer, chief economist of the PIK, holds a professorship in economics funded by the Michael-Otto Foundation at the Technische Universität Berlin.